Let no one use God as a shield while planning and carrying out acts of violence and oppression. May no one use religion as a pretext for actions against human dignity and against the fundamental rights of every man and woman. Pope Francis, Albania, September 2014. As religious leaders, we are obliged to denounce all violations against human dignity and human rights. As such, any violence which seeks religious justification warrants the strongest condemnation because the omnipotent is the God of life and peace. 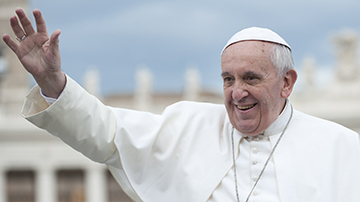 Pope Francis, Religious Affairs Directorate, Turkey, November 2014. Love is the measure of faith. Pope Francis, Tweet, November 27, 2014. To change the world we must be good to those who cannot repay us. Pope Francis, Tweet, October 18, 2014. Pope Francis (born Jorge Mario Bergoglio, 17 December 1936) is pope of the Catholic Church, in which capacity he is both Bishop of Rome and absolute sovereign of the Vatican City State. Throughout his public life, both as an individual and as a religious leader, Pope Francis has been noted for his humility, his concern for the poor and his commitment to dialogue as a way to build bridges between people of all backgrounds, beliefs and faiths. – Wikipedia Biography: Read More.